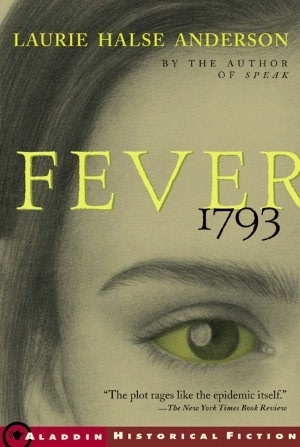 One of the books I read this summer was the YA novel, Fever 1793, by Laurie Halse Anderson. This work of historical fiction depicts the yellow fever epidemic that struck Philadelphia, then our nation's capital, in 1793. One of my favorite aspects of the book was the way Ms. Anderson started each chapter with an excerpt from a letter, diary, cookbook, pamphlet, or newspaper article written during that time. Many of these snippets were written by such well-know historical figures as Thomas Jeffeerson and Ben Franklin. What a wonderful example for teaching the importance of primary source documents and all that they reveal. Moreover, I was struck by all the opportunities this novel offers for incorporating informational text, in accordance with the Common Core. Let's take for example, my second sentence of this post, the fact that our nation's capital was once housed in Philadelphia. Clearly, the debates surrounding the location of the capital of the new nation are worth exploring, as is the spread and treatment of the disease itself. American doctors treated the illness by isolating patients in tightly closed-up homes, bleeding them, and giving them substances to induce vomitting and diarrhea. Doctors did not realize that the disease was spread by mosquitos. This fact is especially relevant now, in the wake of newspaper reports that this year is expected to be the worst on record for West Nile Virus, also spread by mosquitos. Students could compare and contrast these two ilnesses, their spread and treatment. Treatment of the sick, is another ethical issue that could be debated. As the fever spread in 1793, so did the panic. Victims were carried to the street by their own relatives and left to die. Surviving Philadelphians were barred from entering other cities, even to buy food or supplies. Women who survived the epidemic had to support their families in ways that were socially acceptable during the time, and African-Americans who bravely cared for the ill, were then attacked for their actions. Although the book has a Lexile level of 580, with so many historical, scientific and social issues to explore, this novel provides a plethora of opportunities for teachers to engage students with a moving plot, yet layer informational text to meet the rigor of the Common Core.